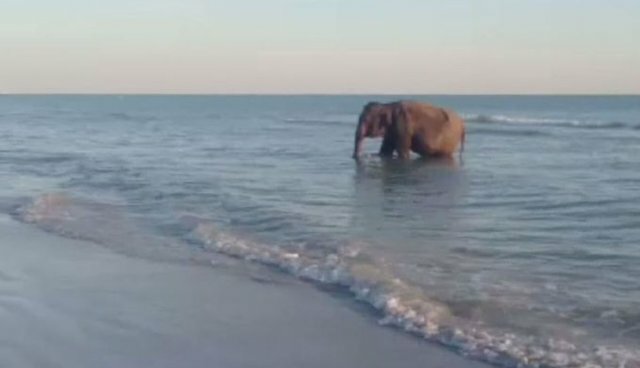 This sad image of an elephant on break from appearing at a birthday party in Florida may actually turn into a legal battle. As it turned out, the elephant had been rented for a birthday party out by a company that transports exotic animals to be paraded around at private events. Unfortunately, the use of intelligent animals for shallow entertainment isn't illegal -- but the way this animal-rental company operates may be. PETA says they filed an official complaint with the U.S. Department of Agriculture and the Florida Fish and Wildlife Conservation Commission to have the incident be investigated as a crime. Under the Animal Welfare Act, elephants must be kept with "sufficient distance and/or barriers between the animal and the general view public so as to assure the safety of animals and the public." If the company is found in violation of the law, it could help put an end to their unsavory business, which by all accounts, depends on paying clients being able to interact freely with animals regardless of the stresses it likely causes them.